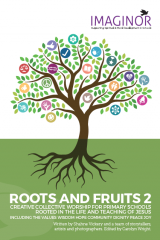 Roots and Fruits 2 is a Christian collective worship resource designed to support whole school worship over the six terms of an academic year. It provides a keynote act of worship for every week of the school year. The focus the resource is on the life and teaching of Jesus and woven through each act of worship is one of the following six values: Hope, Community, Dignity, Wisdom, Joy and Peace. The first 4 of these values are integral to the Church of England Vision for Education and underpin the new evaluation schedule for the Statutory Inspection of Anglican and Methodist Schools (SIAMS). As in Roots and Fruits 1 there is a strong focus on the use of the arts to give creative expression to Bible stories. Work from a wide range of storytellers, poets, visual artists and photographers has been especially commissioned for this volume. Supporting resources and, new for this publication PowerPoint presentations, can be downloaded to use during the acts of worship.